Carrot and Coriander Soup is one of the nation’s favourite soups – and with good reason! 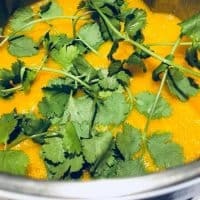 I love carrot soup anyway but adding in some fresh coriander at the end really enhances the flavour. 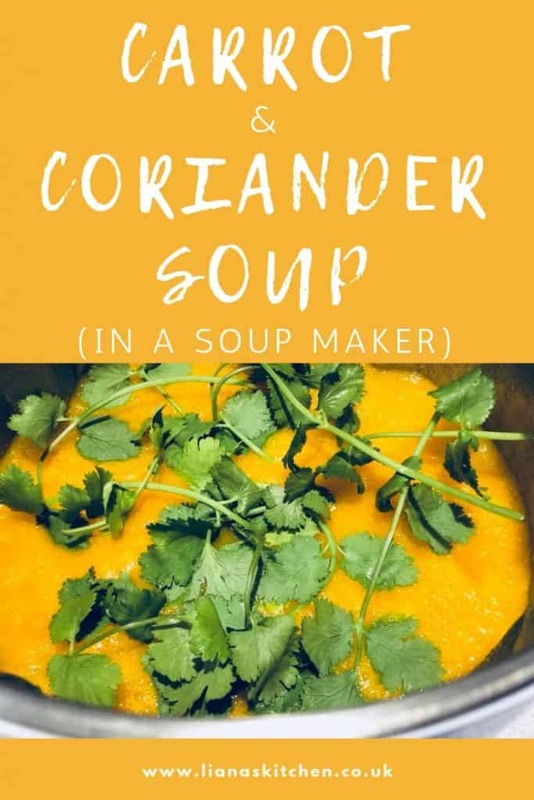 Carrot and coriander soup is easy to make, you can use ground coriander or fresh coriander, or as I prefer, both. 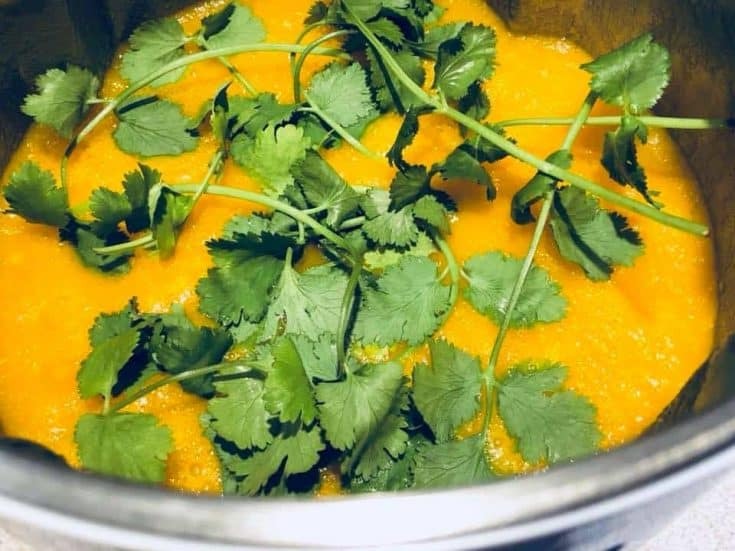 It’s a good idea to add the fresh coriander to the soup right at the end to get as much flavour as possible. I don’t bother to chop up the coriander leaves, I just throw them all in, stalks and all. 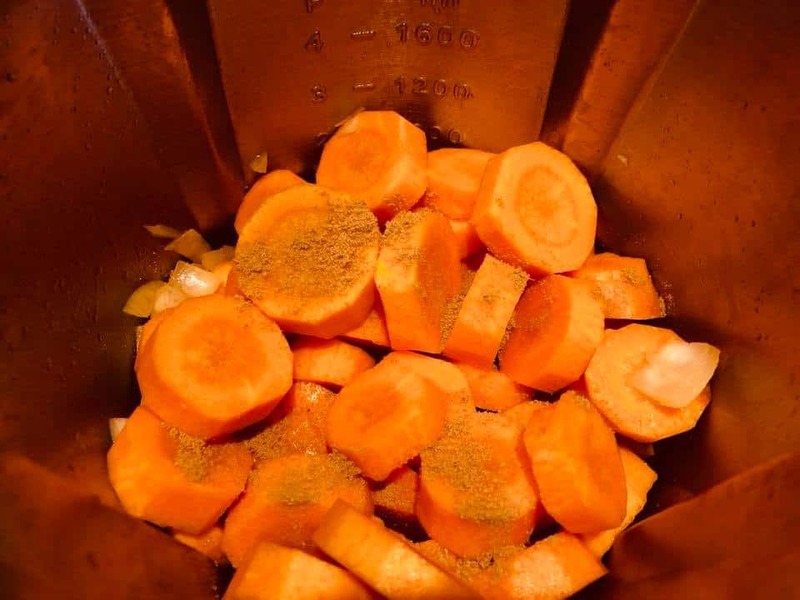 I add them at the end of the soup cycle (I use the smooth setting) and then simply use the blend function on the soup maker which runs for 20 seconds. If you want to make the soup creamier you can stir in some cream, crème fraiche or natural yoghurt at the end. 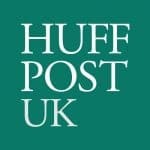 How Many Calories Are In A Bowl Of Carrot And Coriander Soup? If you’re counting calories you’ll be happy to hear that this soup (as with many other soups) comes in at just 111 calories per serving (this recipe serves 4). Add more calories if you are stirring in any cream or yoghurt at the end. Side Note: I use the Morphy Richards Soup Makers, I actually have 2 of them, both of them have the sauté function, which I love. There are differences between the two models – I go into greater depth in comparing the two in this post. As a quick summary, the latest one has more features as well as the ability to make fewer portions (and therefore less potential waste) but you also have to keep the lid on to use the sauté function unlike the previous model where you can sauté with the lid off (which I prefer). Did you make this recipe? I’d love to hear what you thought of it in the comments! Optional: Blend manually to puree the coriander leaves for a completely smooth soup. The final calories per serving does not include olive oil or any cream you might choose to add at the end. How much ground coriander if you don’t have fresh? Hi, I made this recipe last week with my new soup maker 😀. I used just 1 teaspoon as in the recipe and none at the end and it was perfect and thoroughly enjoyed by everyone. Will definitely make again. Great Amanda, I’m so glad you enjoyed it – have fun making lots of tasty soups in your new soup maker! Why does the soup require blending manually please?